When I went to Snap this year, I had the pleasure of tie dying a scarf with i Love to Create. I have tie dyed a few things in the past and had just as much fun dying my scarf while I was there. Over the summer I was pleasantly surprised to get a fun box on my doorstep from i Love to Create! 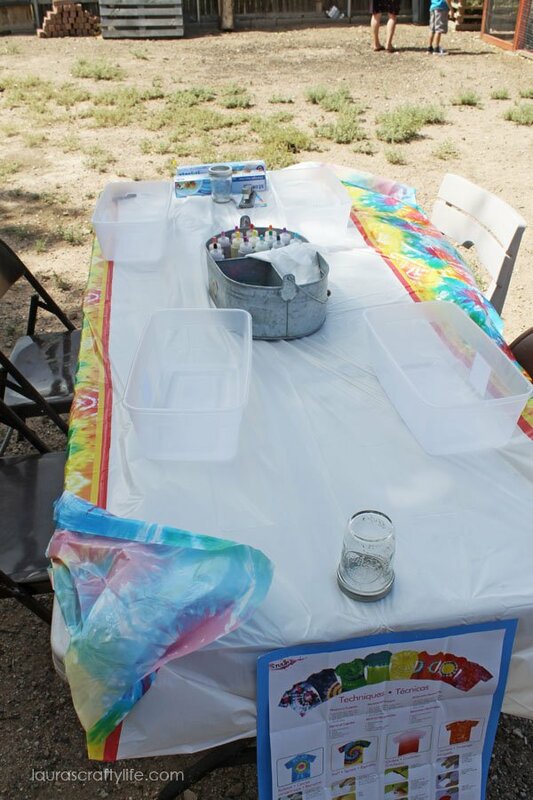 It included a party tie dye pack and some copies of the printable tie dye party decor you can find at the Tie Dye Your Summer website. 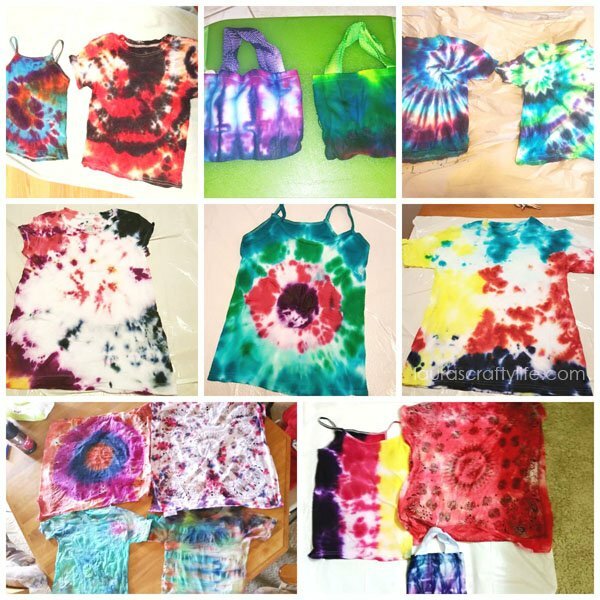 Right away, I thought it would be so much fun to have a tie dye play date party over the summer with some of our friends and their kids. At Snap, they had a great idea to do the dying in inexpensive plastic bins to contain the mess. I knew this would work perfectly for the kids at the party as well. For the decor I kept it pretty simple. 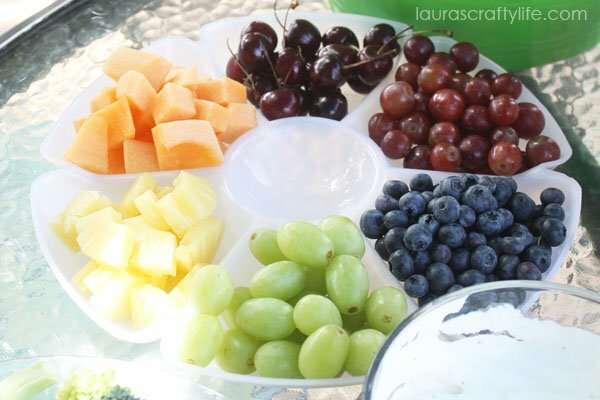 We were outside, so all the food was placed on our regular patio set. 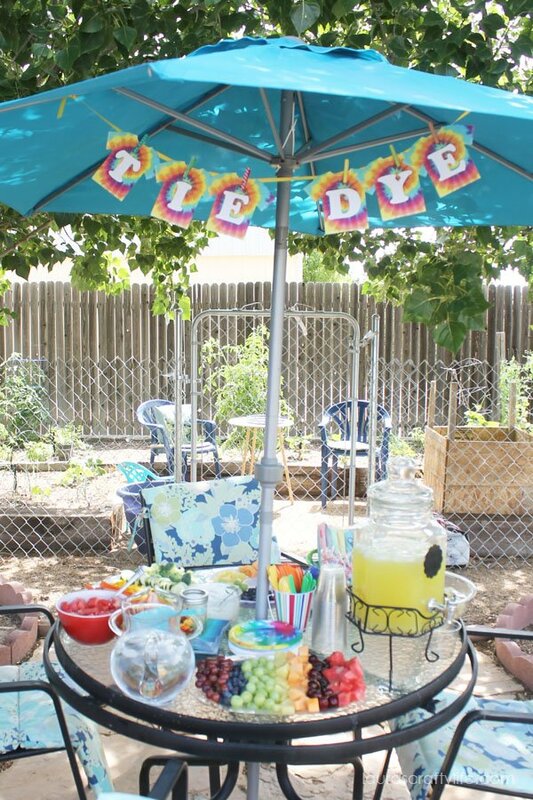 I hung the tie dye party banner above the table under the umbrella. I used a yellow ribbon that I tied to the umbrella and clipped the tie dye party banner onto the ribbon with decorated clothespins. All the food was rainbow themed, which I thought was fitting for the party. 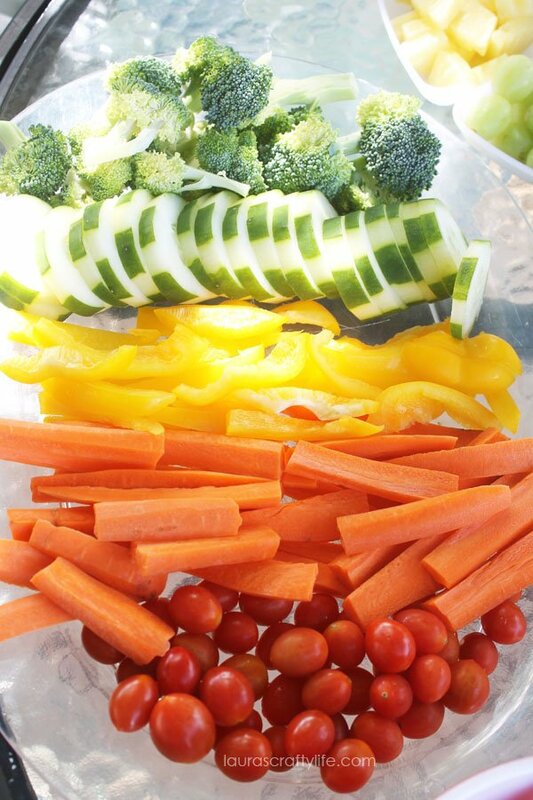 I cut up fruits and veggies and arranged them in rainbow patterns. For drinks we had party punch and water. I found rainbow goldfish crackers to serve. And I made a pasta salad using the tri-colored spiral pasta. I found some fun rainbow hued napkins at Target. And I found tie dye plates at Walmart. I purchased small sets of plastic silverware in red, orange, yellow, green and blue and placed them inside a rainbow striped bucket I found at the Dollar Spot at Target. For a treat I had a jar full of Dum Dum suckers and also rainbow colored popsicles. For the actual tie dying, I purchased one item for each child to tie dye. I found some small tote bags at Hobby Lobby. With a coupon these were really inexpensive. I also bought a package of small white tees, white camisoles and some handkerchiefs. Each child was able to choose one item to tie dye. And I told the parents to bring extra items if they wanted to tie dye something else. 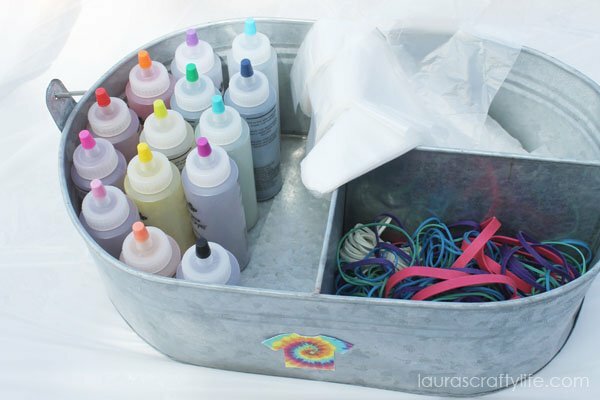 I used my metal bucket to corral the tie dye bottles, gloves and rubberbands. I purchased extra rubberbands and gloves to have on hand to be sure we had enough. I taped the little tie dye shirt cutouts to the side of the bucket with double sided adhesive. I purchased six inexpensive plastic bins. I used one of the printable party logos to decorate each bin. I simply taped them on with clear packing tape. After each person did their tie dye, we simply rinsed the bin out with the garden hose and it was ready to go for the next person. 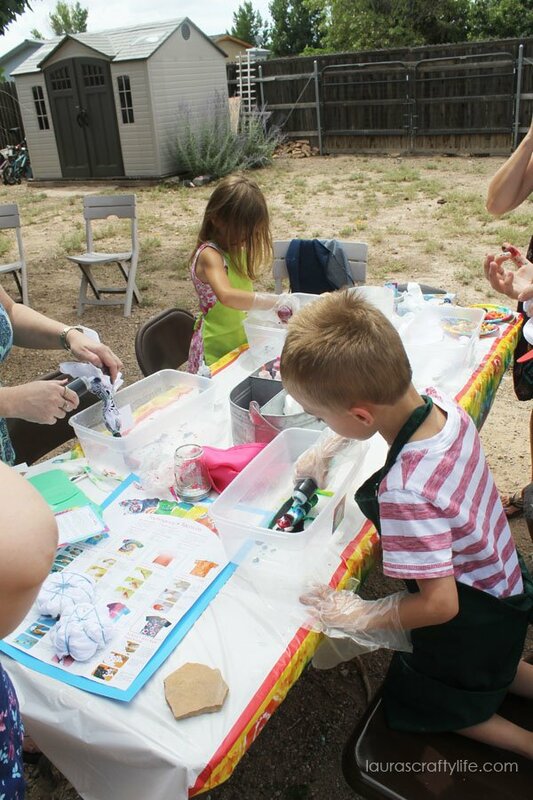 This tie dye kit we used was great! It had SO many colors to choose from. 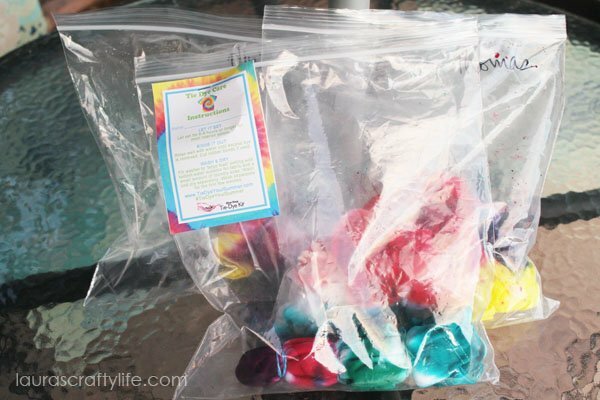 To prepare your tie dye solution, you add water to the bottle up to the fill line and shake it well. Our particular kit said it had enough supplies for six people, but we had more than enough for all the kids. I would say we tie dyed over twenty items in all and I still had some tie dye left over after the party. After you dye your item you need to let it sit for 6 to 8 hours before you rinse it out and wash it. I had gallon size plastic bags for each guest. We wrote names on them with a Sharpie pen and I stapled an instruction sheet to each bag. It was so fun later that night to see pictures on Facebook of everyone’s finished creations! 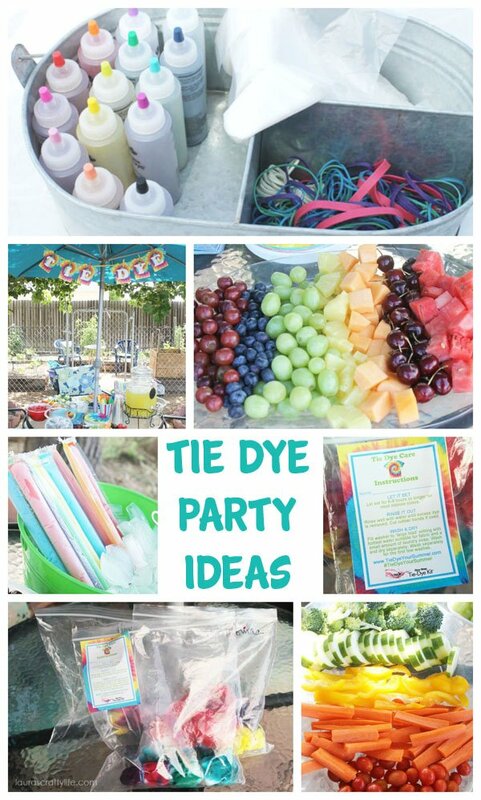 This was a fun and easy party to put together because of the kit that included everything for tie dying and the fun printable party decor! I chose to purchase one item per person to tie dye at the party. To cut down on costs, you can ask each person to bring an item in the invitations. Have aprons available (or use plastic trash bags with a hole cut in the top) to protect the clothing of your guests. 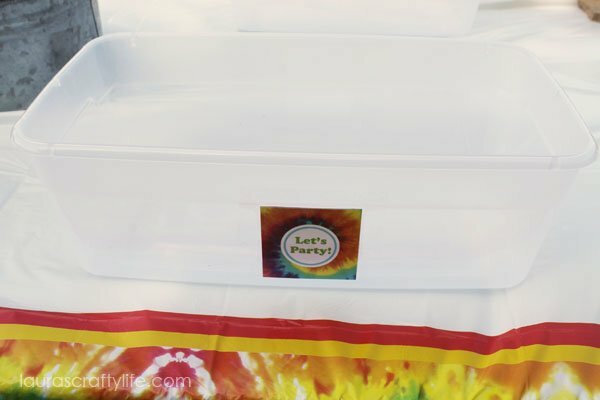 Use small plastic bins for your guests to tie dye their projects in. 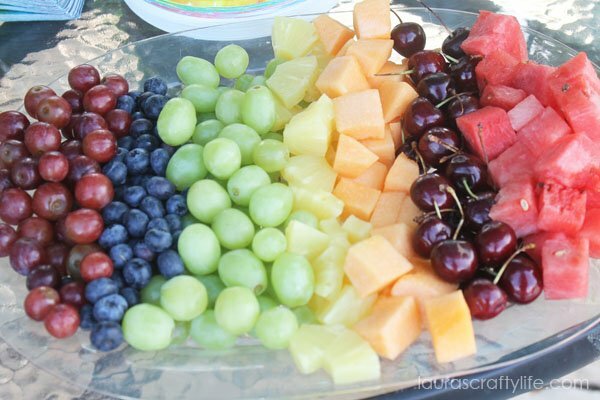 Only mix up the colors of tie dye as you use them. They do not keep long. 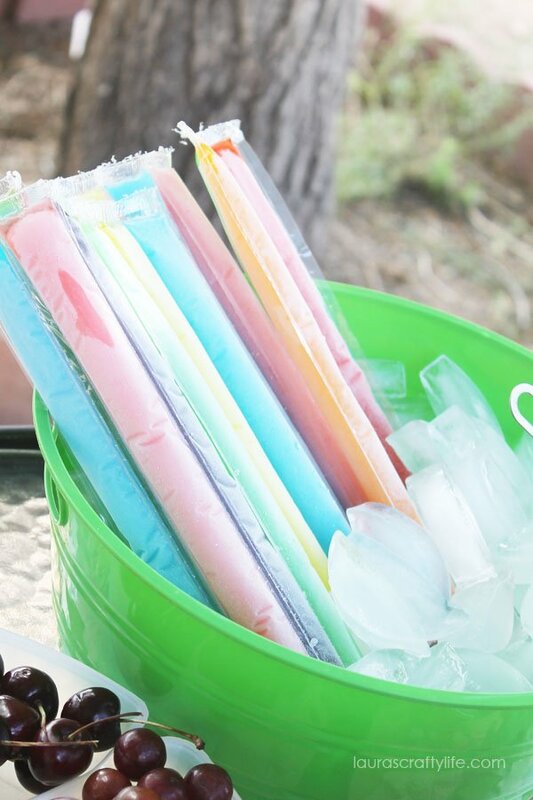 Have a pitcher of water to add to the bottles to mix the one-step tie dye colors. Have gallon size plastic bags on hand for guests to take home their finished projects in. Use a Sharpie marker to write the names on the bags so they don’t get mixed up. Print out an instruction card for each person attending. 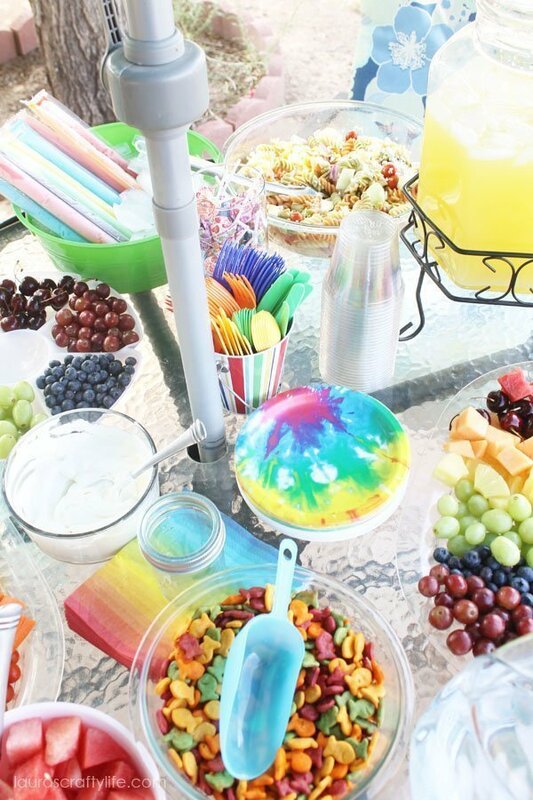 Visit Tie Dye Your Summer for helpful tips and party printables. How long did it take for everyone to tie dye? Was trying to figure out how long the process took to see if I need to do more activities. It really depends on how many items each person is tie dying and how complicated the designs are. 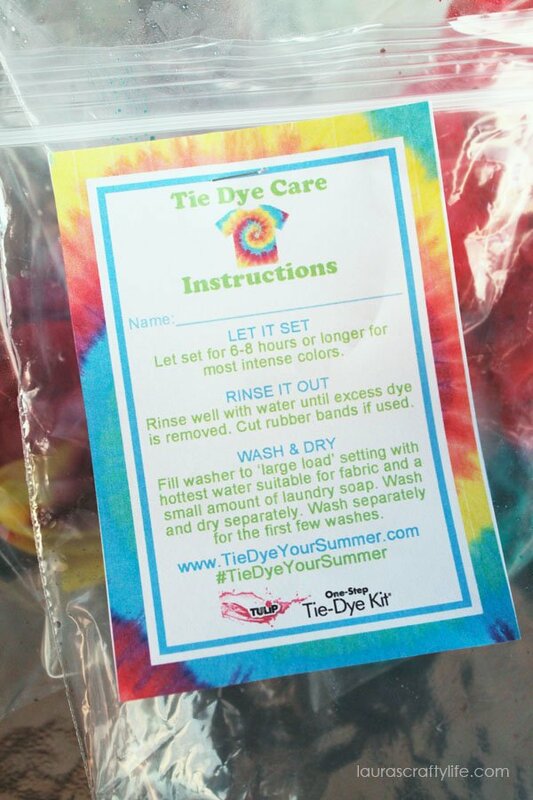 The actual tie dying can be pretty quick since you will have everything ready to go. I had lots of kids that participated so we did it in groups and the other kids played on the swingset, sand box, or with toys in the backyard. I am sorry I don’t have a specific time frame for you, but it is probably a good idea to have something for the kids to do that are not tie dying.